Fiji Diving Holidays | travel&co. Fiji is one of the world’s top 10 dive destinations, with healthy soft coral reefs wowing divers with an abundance of brightly coloured fish as well as thrilling shark encounters. Fiji enjoys the tag “Soft Coral Capital of the World”, and is deservedly rated as one of the top 10 dive destinations in the world. When you dive Fiji, you delve into a vast, varied and colourful underwater playground that boasts something spectacular for divers of every skill level… breathtaking hard and soft corals, wall dives, caves, grottos and shipwrecks. 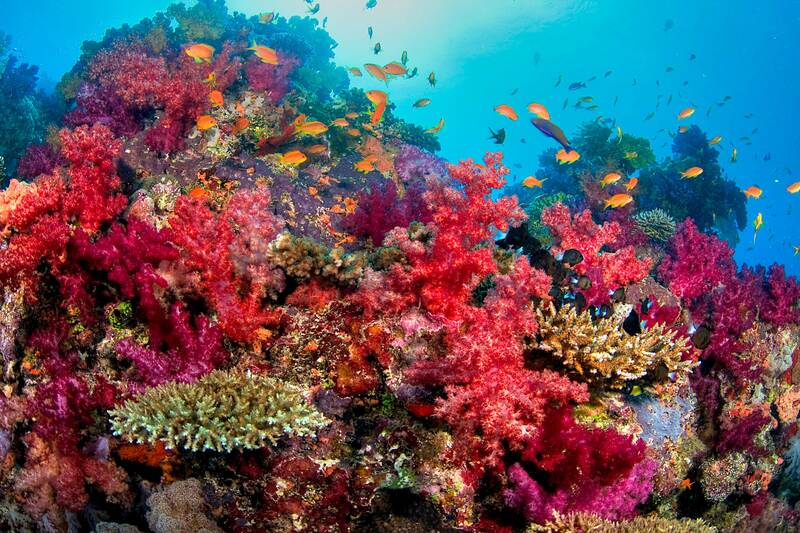 Fiji’s remarkable marine life embodies all the elements that make diving Fiji’s reefs so exceptional. Plenty of pinnacles, bommies and even a wreck or two to keep you enthralled. Passageway drift dives to coral lagoons and outer barrier reefs, dive sites here vary in depths. Rakiraki offers top quality diving with a variety of marine life and fascinating shipwrecks. 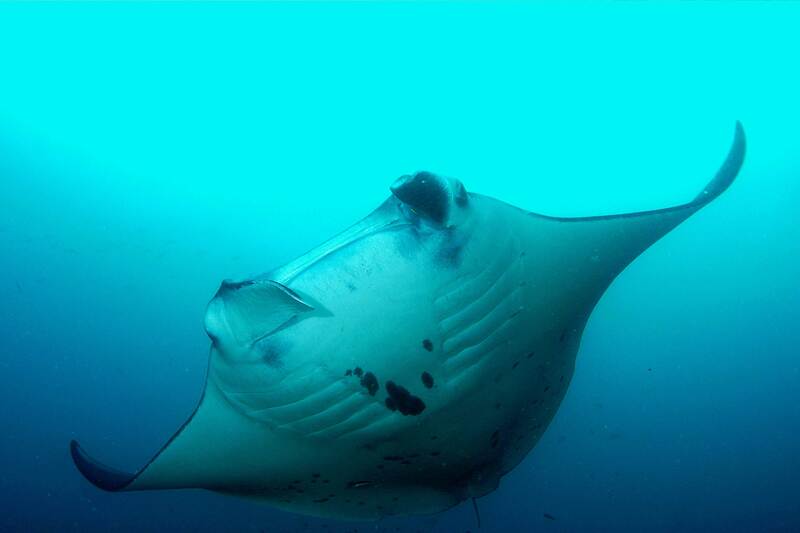 Expect to see plenty of pelagic fish species, barracudas, octopus, reef sharks and manta rays. The Fiji archipelago is at the cross roads of the South Pacific. In the days of sailing ships it was known as The Cannibal Isles and carefully avoided by mariners because of its fierce warriors and treacherous waters. However, in the age of jumbo jets and global travel. Fiji has become the central hub of the exotic South Pacific. The Fiji islands are situated in the South Pacific, midway between Melanesia (Solomons, Vanuatu, New Caledonia and Papua New Guinea) and Polynesia (Tonga, Samoa, the Cooks and French Polynesia). They are south of the equator, just north of the Tropic of Capricorn and west of the International Dateline. The territorial limits enclose an area of 1.3 million sq km (half a million sq mi), but only 1.5% of this is dry land. About 300 islands make up the nation. Viti Levu at 10,400 sq km and Vanua Levu at 5587 sq km are the biggest islands. Almost 80 percent of the population live on these two islands. The majority of the population live in the rural areas and the outer islands. Only about 40 percent of the population live in urban areas. Taveuni and Kadavu are also substantial islands, but the rest of the country is made up of small islands divided into the Lomaiviti, Lau, Moala, Yasawa, Mamanuca and Rotuma Groups. Many of these islands are relatively untouched and there are many beautiful reefs, lagoons and harbours, as well as natural vegetation. The vast majority of Fiji’s land mass is volcanic in origin, with some reef-formed limestone and coastal sedimentary formations. The major islands are generally mountainous in the interiors which creates a rain shadow effect. The western sides of Viti Levu and Vanua Levu are drier and less thickly vegetated than the eastern areas. The difference in the rainfall between the two sides is striking. The eastern side of Viti Levu, where the capital city of Suva is located, averages 300 cm in precipitation whereas in the western side where Nadi International Airport is found, averages about 165 cm. Thus on any given day, your chances of getting wet are much greater on any of the larger islands’ eastern sides, rather than in the west. The ocean environment includes coral reefs, lagoons and deep pelagic areas all of which team with fish. 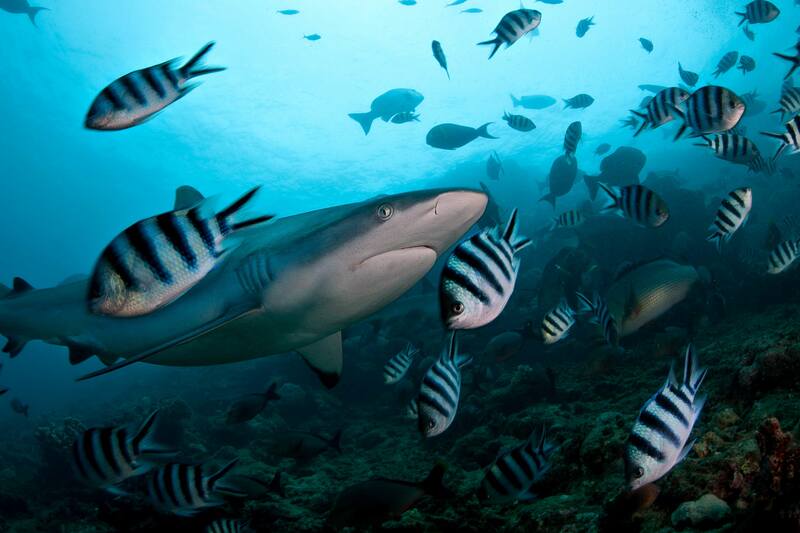 As many visitors can attest to, Fiji’s reputation as a world-class dive destination is well deserved. 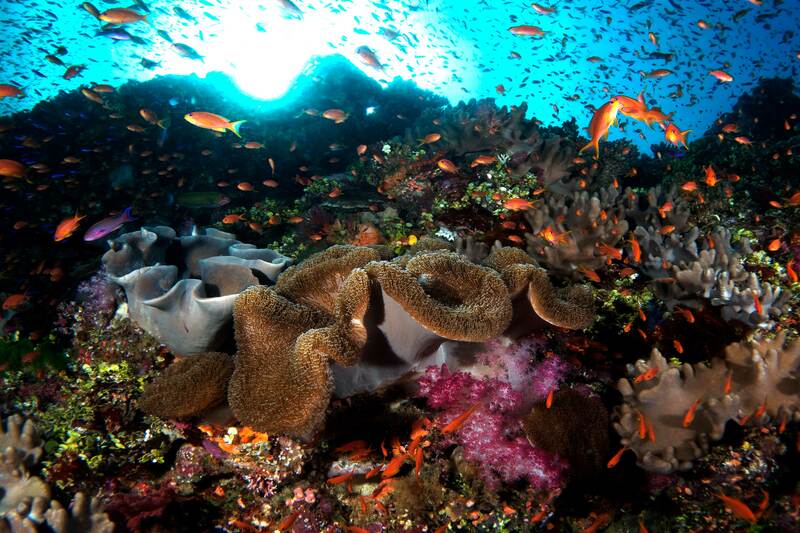 In Fiji’s rich reef system one may find a multitude variety of marine life all within a few square meters. According to Fijian legend, the great chief Lutunasobasoba led his people across the seas to the new land of Fiji. Most authorities agree that people came into the Pacific from Southeast Asia via Indonesia. Here the Melanesians and the Polynesians mixed to create a highly developed society long before the arrival of the Europeans. Fiji was first settled about three and a half thousand years ago. The original inhabitants are now called “Lapita people” after a distinctive type of fine pottery they produced, remnants of which have been found in practically all the islands of the Pacific east of New Guinea, though not in eastern Polynesia. Linguistic evidence suggests that they came from northern or central Vanuatu, or possibly the eastern Solomons. Before long they had moved further on, colonising Rotuma to the north, and Tonga and Samoa to the east. From there, vast distances were crossed to complete the settlement of the Pacific, to Hawaii in the north, Rapanui [Easter Island] in the east and Aotearoa [New Zealand] in the south. The Fijians were described as formidable warriors and ferocious cannibals, builders of the finest vessels in the Pacific, but not great sailors. They inspired awe among the Tongans, and all their products, especially bark-cloth and clubs, were highly esteemed and much in demand. They called their home Viti, but the Tongans called it Fiji, and it is by this foreign pronunciation, first promulgated by Cook, that these islands are now known. After the explorers, other Europeans followed. For over half a century, Fijian culture enjoyed what has been called its ‘golden age’, as tools and weapons brought by traders were turned by resourceful chiefs to their own advantage. Canoes and houses were built, confederations formed and wars fought on a grand scale without precedent. Gradually and inevitably however, the Fijian way of life was changing. As Christianity spread in the islands, wars ceased abruptly and western clothing was adopted. Cannibalism practised in Fiji at that time quickly disappeared as missionaries gained influence. When Ratu Seru Cakobau accepted Christianity in 1854, the rest of the country soon followed and tribal warfare came to an end. After Fiji was ceded to Great Britain in 1874 epidemics nearly wiped out the population and it seemed as if the natives were doomed. But the colonial government took the Fijians’ side. Land sales were forbidden, health campaigns implemented and the population picked up again. Theirs was not, of course, the culture of the heathen ‘golden age’, but one modified by the new religion and increasingly the new economic order. Yet in today’s Fiji, independent since 1970, a surprising amount has survived. The country’s central position in the region has been strengthened by recent developments in sea and air communications. Today, Fiji plays a major role in regional affairs and is recognized as the focal point of the South Pacific. Fiji enjoys an ideal South Sea tropical climate. It is thus a perfect holiday destination, especially for those trying to escape the severe Northern Hemisphere winters. Maximum summer temperatures average 31 Degrees Celsius (88 Degrees F) and the mean minimum is 22 Degrees Celsius (72 Degrees F) The winter average maximum is 29 Degrees Celsius (84 Degrees Celsius F) and the mean minimum is 19 Degrees Celsius (66 Degrees Celsius F). These are much cooler in the uplands of the interior of the large islands. A cooling trade wind blows from the east southeast of most of the year. It usually drops to a whisper in the evening and picks up again by midmorning. Fiji has a climate ideally suited for the outdoors, the beach and surf, for light cotton dresses, barbecues and water sports. Airports: Fiji has two international airports – Nadi, the principal gateway and Nausori, near Suva. Nadi – Wananavu Beach Resort (Raki Raki): 2 hrs drive by road.